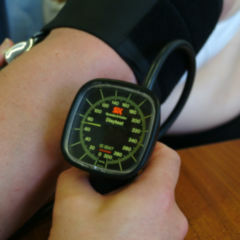 Patients with systolic hypertension lose healthy life years and die earlier. Researchers have been able to impressively show this once more. The question remains: which measure should be achieved - 140 mmHg or better yet 120 mmHg? This is where the protagonists' paths diverge. At regular intervals researchers examine the risk factors which lead to death. They have presently published a new evaluation of the “Global Burden of Disease” Study. The not quite surprising conclusion: arterial hypertension still occupies a place at the forefront of the global negative list. Some additional details: Christopher J. Murray of the University of Washington, together with colleagues, has examined the influence of 79 parameters on our health. The endpoint he chose was disability-adjusted life years ( DALY). This concept encompasses not only time lost due to early death, but also impairment of normal life by an illness. Murray assessed systolic hypertension to be the most important individual risk factor for premature deaths, a conclusion arrived at by previous such pieces of work. 10.4 million deaths and 208.1 million DALYs are accountable to it. Then follow tobacco (6.1 million premature deaths, 143 500 000 DALYs) and excessive BMI (4.4 million premature deaths, 134 million DALYs). Given these figures, it is clear what sort of importance can be attached to antihypertensive therapy. At the last Congress of the European Society of Cardiology (ESC) in London, experts pursued the question as to which risk groups should particularly be in focus. Every year in Europe about 77,000 women and 253,000 men under 65 years of age die of coronary heart disease (CHD) – a massive gender difference. An investigation into the effects of a divers range of factors was ably assisted by the Vorarlberg Health Examination Database, with its 117,264 people involved. All participants were recruited without diseases at an age of less than 50 years. Over a time period of 14.6 years cardiologists recorded 3,892 deaths from coronary heart disease. 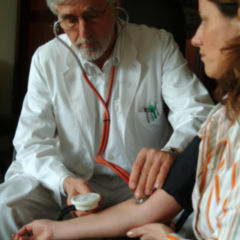 Co-author Professor Dr. Gabriele Nagel of the University of Ulm declares systolic blood pressure to constitute 21.7 percent of the gender divergence. Cholesterol then follows with ten percent. 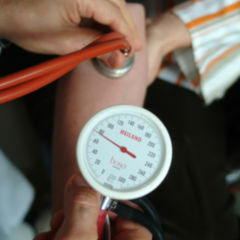 Hypertension is therefore the most important factor in explaining cardiovascular disease among men under 50 years of age. Therefore systolic hypertension should be diagnosed and treated in time through appropriate lifestyle modification or drug therapy, Nagel adds. Scientific opinions divide once again on the topic of target values. According to current guidelines a systolic blood pressure below 140 mmHg is the declared objective – among patients with higher or lower cardiovascular general risk. Interim results of the SPRINT trial (Systolic Blood Pressure Intervention Trial) are providing fuel for controversial discussions at present. The National Institutes of Health (NIH) occupies the role here of being the trial’s sponsor, meaning that there is a quite reduced likelihood of excess influence from industry. A total of 9,361 patients participated. They had cardiovascular disease (1,877 people) or kidney disease in their medical history (2648) and a systolic blood pressure above 130 mmHg. SPRINT’s aim was to investigate different treatment regimens: 140 mm Hg as recommended in current guidelines, or 120 mm Hg. The endpoint selected by cardiologists included heart attacks, heart failure, strokes and cardiovascular-related deaths. 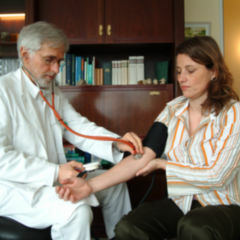 When doctors lowered systolic blood pressure to below 120 mmHg, dramatic effects were demonstrated. Mortality declined by around 25 percent, and the rate of cardiovascular events dropped by about 30 percent – comparing these cases with conventional therapeutic targets. Bearing this in mind, it should not be surprising that the Data Safety Monitoring Board has pulled the emergency brake. Originally, all inquiries were supposed to be completed by the year 2018. The difference between treatment groups was already great enough, write experts. Gary H. Gibbons, director of the National Heart, Lung, and Blood Institute (NHLBI), suspects the presence of “potentially life-saving information” which would allow health professionals to be better able to care for patients. He judges the results to be a “contribution to the development of evidence-based clinical guidelines”. Rightly so? The recently published interim analysis has at minimum reached its goal as a PR exercise: Cardiologists over the globe are discussing the sense and nonsense in relation to new limits, despite all of the data not yet even having been published. Potent antihypertensive medication, especially when used by the elderly, quickly cause dizziness and drowsiness. A fall resulting in death would not have been covered in the endpoints currently selected. Should elderly patients already be taking other medications, they would then end up a great deal further along the path toward polypharmacy. 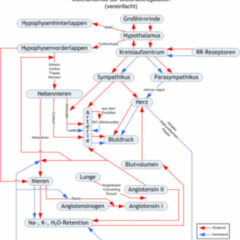 Impaired hepatic and renal function don’t make the picture better. Many unanswered questions – we are now waiting for the publication at the the end of 2015.